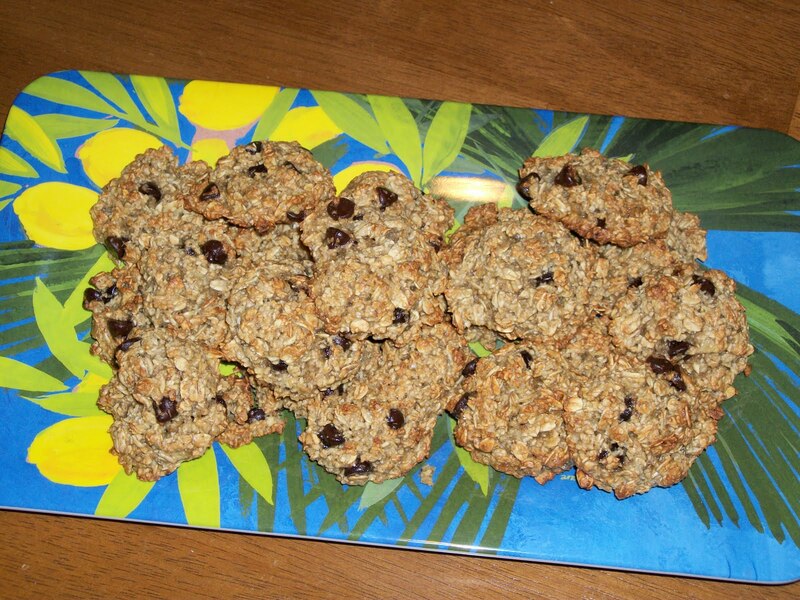 This recipe is from the book Naturally Thin by Bethenny Frankel. 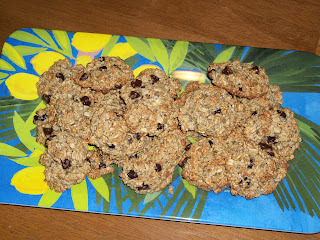 They are extremely healthy and have very little oil, no eggs and they use oat flour instead of regular or wheat flour. They also use raw sugar because Bethenny says this is better for you because it hasn't been processed. And they are pretty darn tasty! I couldn't find oat flour in my store, so I ended up making my own by taking 1.5 cups of old fashioned oats and putting them in my mini-food processor and grinding them up until they are a flour consistency. There will still be some chunks, but because I add even more oats, you don't have to worry about getting it completely fine. Just try and get it ground up the best you can. Preheat oven to 375 degrees. Combine all of the dry ingredients into a bowl. Combine all of the wet ingredients into a separate bowl. Mix dry and wet ingredients together until well combined. Using a med-sized ice cream scoop, drop the batter onto a cookie sheet covered with parchment paper. Bake for 6 mins, then turn the pan and bake for an additional 4 – 6 mins until golden brown. The recipe says you get 10 large sized cookies, but I made mine a little smaller and got about 18 cookies. Enjoy! Hello yet again from Life of Meg's Mingle Monday! It seems the two blogs I picked to visit are both yours! How about that?! :) Great recipes here! I'm about to make some banana bread, & seeing your blog just made me ready to eat it even more! Hi! Visiting from Life of Meg :) Your recipes look awesome! I can't wait to try this one and the chocolate chip banana bread! I have always wanted to try some skinny girl recpies... I'll have to steal this one and try it, they sound and look so yummy! Found your blog on megnificentlife! Hi from Mingle Monday! Your recipes look delicious!! I'm going to have to try these!! Hey- I saw your blog on Mingle Monday. This recipe looks fantastic! I'm really into trying to teach myself to bake so I will have to make these. I've been working on cupcakes, but I'm going to have to tackle cookies next. Can't wait to read more from you! Hi from Mingle Monday! I love these cookies! I've actually made them time and time again! As for oat flour I have found it at Whole Foods and I think some Ralph's carry it too. I think I might link to your site tomorrow for my Tasty Tuesday tomorrow! HELLO!! from Mingle Monday, I was already hungry and you just did me in!! This recipe sounds really YUMMY..can't wait to read more!! I'm visiting from Mingle Monday's! Great blog, your recipes look delicious!